Bruce’s Barber Shop at 355 E. Main St. in downtown Hillsboro is one of few that remain. For charging the same prices at the same location for the past 31 years, that’s a fairly impressive feat. 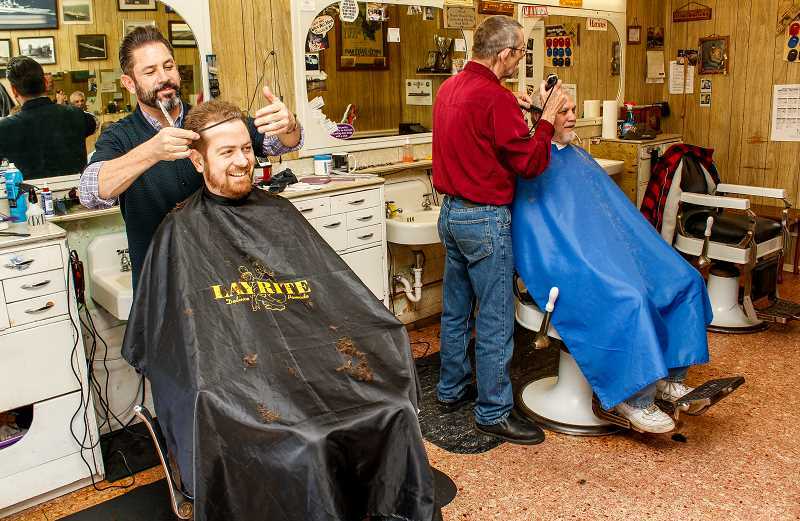 Since all things must change, Bruce’s will someday become Joe’s Barber Shop when owner Bruce Reedy eventually hands the keys over to his partner of two years, Joe Celaya. Yet Reedy isn’t in any hurry. At 68, he still feels like he can stand behind his barber’s chair — the same one he’s been using since 1971 — and provide the service for which he is most well known. For $8, Reedy offers a cut and conversation. It doesn’t really matter how you want it styled, or if you’d prefer silence. He’ll accommodate you either way. “I keep my prices the way they are for the old guys,” Reedy said. Reedy comes from a time when barbershops offered a specific service — a personal, intimate service that men only got when they visited the barber. A straight razor shave behind the ears with menthol Barbasol, a scalp massage, a warm, wet cloth across the back of the neck — a customer could count on these things along with their clipper cut. “Old barbers were family,” Reedy said. From getting together at the local bar after closing time to helping each other out with customers, there was an unspoken code among the local barbers to take care of one another. “Barbers today, they’re just different,” Reedy said. Most are now specialists or stylists. In his opinion, they charge too much, are too competitive and make too much of a show out of the haircut with fades or odd designs. Reedy believes his prices and old school barbershop atmosphere are what keep customers coming back. He estimates he sees 60 clients per week — some of whom have been coming in for more than 40 years. 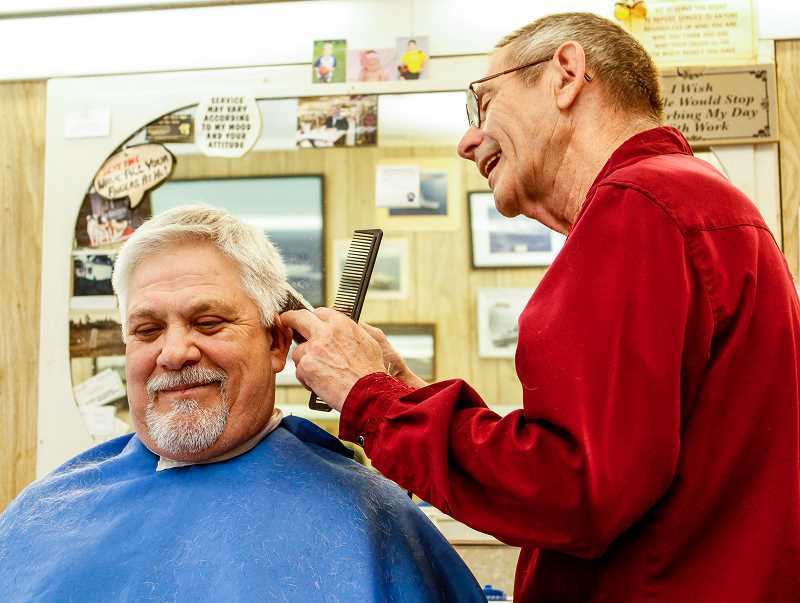 Hillsboro resident Mel Finegan, 82, has been getting haircuts from Reedy since the 1970s. With Reedy’s 49 years of barbering experience, it ought to. The youngest of three, Reedy was 10 when his father died of a brain tumor in 1957. His two older sisters, Janet and Barbara, helped his mother raise him until she began dating Norman Donnelly, the “good ol’ boy” barber who talked Reedy into picking up a pair of shears himself. 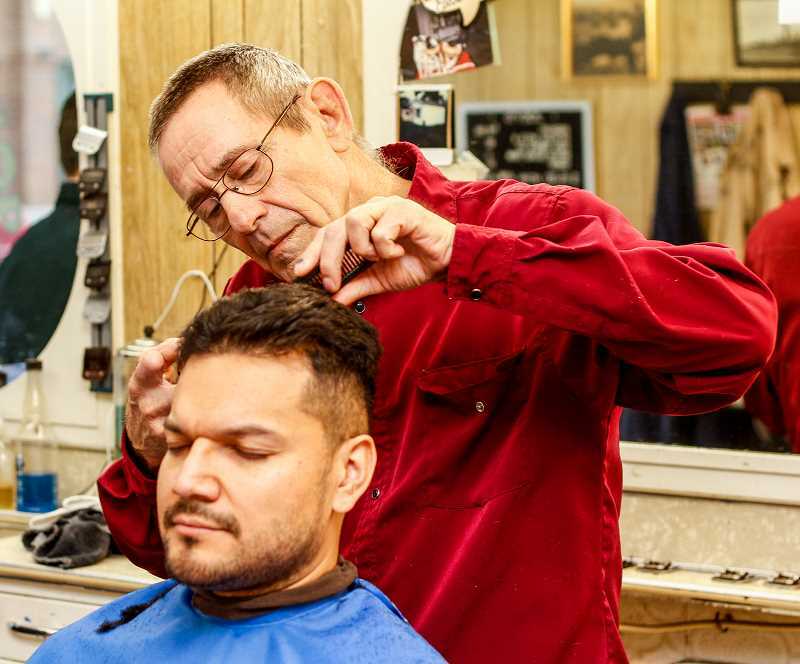 A poor student with few prospects otherwise, Reedy earned his barber certificate from a Portland barber college in 1967 — six months before he was drafted into the Vietnam War. Rather than cut hair, however, Reedy worked in a tank division in Germany and the U.S. for his two-year stint, never setting foot on Asian soil. When he returned to Washington County in 1969, he bounced from barbershop to barbershop before setting up his own establishment on the corner of 239th Avenue and Tualatin Valley Highway in September 1971. Along with his partner, Daryle Piercy, Reedy cut hair at the first Bruce’s for $1.50 a head. The pair worked well together, but the building had its issues. And though Reedy twice replaced the constantly rotting floor, he and Piercy had to move when the building was razed on Feb. 29, 1985. Reedy has been cutting Hillsboro resident Richard Gaumone’s hair (left) off and on since 1997. “By far, Bruce has given me the best haircuts I’ve ever gotten,” Gaumone said. Together, Reedy and Piercy partnered up with Tom Owens, the previous owner of the Main Street barbershop, on March 1. Owens purchased it from another barber (Buck) who had purchased it from yet another barber (another Tom) — but that’s as far back as anyone remembers. From what he’s heard, Reedy believes the Main Street location has been a barbershop since at least 1949. So when he purchased the business from Owens for $2,000 in 1986, the legacy continued. And Owens continued to cut hair with Reedy and Piercy until two years before his death in 2005 at age 85. Reedy and Piercy saw a handful of co-barbers come through their shop to help out. Some were good, some not so good. Some lasted longer than others, but few stuck around for more than one year. And on July 5, 2007, after 36 years together, Piercy died unexpectedly at 60 from a burst aorta. “He was fine one day, dead the next,” Reedy said. A memorial to Piercy still graces a corner of Bruce’s shop. That same year, Reedy accidentally cut off most his right index finger with a table saw. Suffering his own physical ailments, Reedy planned to one day give the shop to his other partner of seven years, Rene Contreras. But mounting diabetic complications took Contreras out of the barber world in 2013, leaving Reedy to manage on his own. That’s when Celaya showed up. So, to win Reedy over, Celaya bolstered his barber experience by picking up work in Portland and at other Hillsboro shops for the next two years as Contreras came to the realization he was unable to continue barbering. With Contreras out, Celaya got his foot in the door and a barber chair of his own. Now the two work side-by-side and bicker like an old married couple — and Celaya is just counting the days until Reedy gives him the keys. Until then, Reedy will continue to cut hair at Bruce’s Barber Shop on Main Street for $8 — unless you want a butch cut. Then it’s only $4. “An old guy once told me, ‘If you can’t make a living at it, quit fighting and go get another job,’” Reedy said. “I’ve been prosperous for the 40 years I’ve been in the area. When I turn 70 I’ll think about it, but I’ll probably just work longer.